The species is found on a number of heathland sites in Surrey. There are old records (1858 1909 and 1910) from the New Forest near Lyndhurst and Brockenhurst, South Hampshire. It is widespread in central and southern Europe. Oxyopes is found on mature dry heathland, usually near the top of heather and seemingly with a preference for south-facing slopes. Adults occur in late May and June. 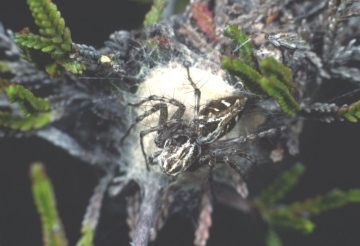 The spider is abundant on a few small heathland areas in west Surrey. Denton (1999d) comments on its local abundance on north Surrey Tertiary heaths, but its rarity on the Lower Greensand heaths to the south. The species has not been found in the New Forest for over ninety years. Fire and loss of heathland habitat. Because of the increased fire risk that mature heather presents, heaths are often managed to avoid this phase, even on nature reserves. However, at Chobham Common, lack of management has resulted in birch and pine invasion. Accidental fires are also too frequent an occurrence on parts of this common, causing replacement of heath by Molinia caerulea. In parts of the New Forest, grazing by livestock prevents the heather developing into tall mature plants, but there are still areas of apparently suitable structure. Management: needs to be geared to ensuring good representation of heather in the mature phase. Thus, if burning is to be used, small portions of the site should be treated in rotation on a cycle of about twenty years. If grazing is the favoured option, it should be at a low intensity and rotational.